Most listeners prefer tonal music to atonal music, but what exactly is the difference between them? In this groundbreaking work, author Dmitri Tymoczko identifies five basic musical features that jointly contribute to the sense of tonality, and shows how these features recur throughout the history of Western music. Tymoczko creates for the reader a new framework for thinking about music, one that emphasizes the commonalities among styles from Medieval polyphony to contemporary jazz. 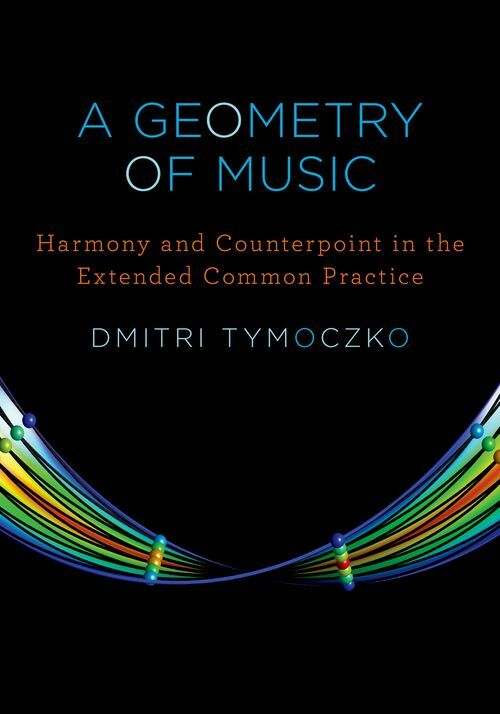 A Geometry of Music provides an accessible introduction to Tymoczko's revolutionary geometrical approach to music theory. The book shows how to construct simple diagrams representing the relationships among familiar chords and scales. This gives readers the tools to translate between the musical and visual realms, revealing surprising degrees of structure in otherwise hard-to-understand pieces. Tymoczko uses these theoretical ideas to retell the history of Western music from the eleventh century to the present day. Arguing that traditional histories focus too narrowly on the "common practice" period from 1680-1850, he proposes instead that Western music comprises an extended common practice stretching from the late middle ages to the present. Using analysis to make his argument clear, he discusses a host of familiar pieces by Bach, Mozart, Chopin, Debussy, Stravinsky, Shostakovich, Miles Davis, Bill Evans, and others. A Geometry of Music is accessible to a range of readers, from undergraduate music majors to scientists and mathematicians with an interest in music. Defining its terms along the way, it presupposes no special mathematical background and only a basic familiarity with Western music theory. The book also contains exercises designed to reinforce and extend readers' understanding, along with a series of appendices that explore the technical details of this exciting new theory. 1.2. PERCEPTION AND THE FIVE FEATURES. A. HARMONY AND COUNTERPOINT CONSTRAIN EACH OTHER. B. SCALE, MACROHARMONY, AND CENTRICITY ARE INDEPENDENT. C. MODULATION INVOLVES VOICE LEADING. D. MUSIC CAN BE UNDERSTOOD GEOMETRICALLY. 1.4 MUSIC, MAGIC, AND LANGUAGE. 1.5 OUTLINE OF THE BOOK, AND A SUGGESTION FOR IMPATIENT READERS. 2.3 TRANSPOSITION AND INVERSION AS DISTANCE-PRESERVING FUNCTIONS. 2.5 VOICE LEADINGS AND CHORD PROGRESSIONS. 2.9 HARMONY AND COUNTERPOINT REVISITED. 3.2 THE PARABLE OF THE ANT. 3.4 CHORD PROGRESSIONS AND VOICE LEADINGS IN TWO-NOTE CHORD SPACE. 3.6 HARMONIC CONSISTENCY AND EFFICIENT VOICE LEADING. 3.7 PURE PARALLEL AND PURE CONTRARY MOTION. 3.11 TRIADS ARE FROM MARS, SEVENTH CHORDS ARE FROM VENUS. 4.1 A SCALE IS A RULER. 4.2 SCALE DEGREES, SCALAR TRANSPOSITION, SCALAR INVERSION. 4.3 EVENNESS AND SCALAR TRANSPOSITION. 4.5 MODULATION AND VOICE LEADING. 4.6 VOICE LEADING BETWEEN COMMON SCALES . 4.8 SCALAR AND INTERSCALAR TRANSPOSITION. 4.9 INTERSCALAR TRANSPOSITION AND VOICE LEADING. 4.10 COMBINING INTERSCALAR AND CHROMATIC TRANSPOSITIONS. 5.4 MODULATING THE RATE OF PITCH-CLASS CIRCULATION. 5.7 WHERE DOES CENTRICITY COME FROM? 5.8 BEYOND "TONAL" AND "ATONAL." 6.3 TRIADS AND THE RENAISSANCE. 6.8 THE EXTENDED COMMON PRACTICE. 7.1 THE THIRDS-BASED GRAMMAR OF ELEMENTARY TONAL HARMONY. 7.2 VOICE LEADING IN FUNCTIONAL HARMONY. 7.4 MODULATION AND KEY DISTANCE. 7.6 A CHALLENGE FROM SCHENKER. 8.4 SCHUBERT AND THE MAJOR-THIRD SYSTEM. A. GRIEG'S "DROMMESYN," (VISION), OP. 62 NO. 5 (1895). C. MICHAEL NYMAN'S "THE MOOD THAT PASSES THROUGH YOU" (1993). A. DEBUSSY'S "DES PAS SUR LA NEIGE" (1910). B. JANACEK'S "ON AN OVERGROWN PATH," SERIES II, NO. 1 (1908). C. SHOSTAKOVICH'S FS MINOR PRELUDE AND FUGUE, OP. 87 (1950). D. REICH'S "NEW YORK COUNTERPOINT" (1985). E. REICH'S "THE DESERT MUSIC," MOVEMENT 1 (1984). F. THE WHO'S "CAN'T EXPLAIN" (1965) AND BOB SEGER'S "TURN THE PAGE" (1973). A. GRIEG'S "KLOKKEKLANG," (BELL RINGING), OP. 54 NO. 6 (1891). B. "PETIT AIRS," FROM STRAVINSKY'S HISTOIRE DU SOLDAT (1918). C. REICH'S "CITY LIFE" (1995). D. STRAVINSKY'S "DANCE OF THE ADOLESCENTS" (1913). E. THE MILES DAVIS GROUP'S "FREEDOM JAZZ DANCE" (1966). 10.2 FROM THIRDS TO FOURTHS. 10.4 ALTERED CHORDS AND SCALES. 10.5 BASS AND UPPER-VOICE TRITONE SUBSTITUTIONS. 10.6 POLYTONALITY, SIDESTEPPING, AND "PLAYING OUT." 10.8 JAZZ AS MODERNIST SYNTHESIS. APPENDIX B. CHORD GEOMETRY: A TECHNICAL LOOK. APPENDIX C. DISCRETE VOICE LEADING LATTICES. APPENDIX D. THE INTERSCALAR INTERVAL MATRIX. APPENDIX E. SCALE, MACROHARMONY, AND LERDAHL'S "BASIC SPACE." APPENDIX F. SOME STUDY QUESTIONS, PROBLEMS, AND ACTIVITIES. Dmitri Tymoczko is a composer and music theorist who teaches at Princeton University. His 2006 article The Geometry of Musical Chords was the first music theory article published in the 127-year history of Science magazine, and was widely covered in the popular press. His music has been performed by ensembles throughout the country, and he has received a Rhodes scholarship, a Guggenheim fellowship, and numerous other awards.